BMW has revealed the first images of the second generation of what it describes as one of the world’s most recognisable sports activity coupé – the X4. Making its debut at the Geneva Motor Show next month, the new BMW X4 will arrive in Ireland this summer with a starting price of €67,190 (on the road ) for the 190hp, 2.0 diesel, whose torque peaks at 400Nm. This version accelerates in 8.0 seconds from zero to 100km/h, and returns a claimed provisional average consumption of 5.6–5.4 l/100km (52.3 combined mpg ), and CO2 emissions of 142g/km. Interestingly, the provisional fuel consumption and emissions figures as per the EU test cycle may vary depending on the tyre format specified. The other mainline option is X4 M40d (326hp ), whose torque peaks at 680Nm. It carries a price tag of €90,675, and it move from standstill to 100kmh in just 4.9 seconds and has a top speed of 250kms. And similar to the X4 20d, the claimed provisional figures for combined fuel consumption stands at 6.6–6.4 l/100km (44.1mpg ), and a CO2 figure of 170g/km. The pictures show it brings together the hallmark features of a BMW X model with the sporting elegance of a coupé. And it is hard to argue with a formula that saw its predecessor achieve more than 200,000 global sales since its debut in 2014. In addition to the exterior design with a strong coupé silhouette, BMW tells us the new X4 gains enhanced driving dynamics, more refinement, and state-of-the-art driver assistance systems and connectivity. 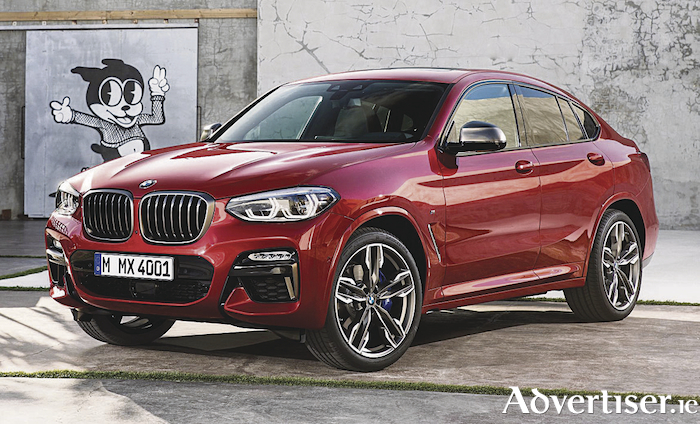 The range will also be enhanced by the addition of two new M Performance models – the BMW X4 M40i and M40d. BMW says these additions are to further underscore the high performance of the vehicle and cater to customer tastes. The new X4 is 81mm longer than its predecessor, with 54mm added to the wheelbase and 37mm extra width. It is also lower by 3mm. BMW says all of these elements come together to give it dynamically stretched proportions that emphasise its perfect 50:50 weight distribution and hint at the enhanced performance potential. Two optional M Sport and M Sport X model variants allow drivers to tailor the appearance of the new BMW X4 to reflect their personal tastes. Each comes with stand-alone design features, as well as model-specific 19-inch light-alloy wheels. More on the new BMW X4 when it arrives in the summer and we drive it on Irish roads.